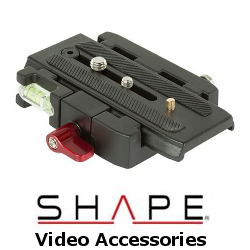 Shop with John Barry Sales for SHAPE camera's & rigs, for SHAPE stabilisers, SHAPE Video Accessories and SHAPE Video cables. SHAPE wlb Inc. is a creative and innovative company. They have been working in the movie business for over 15 years. Their mission is to manufacture supports and accessories for video/photo cameras. Their company fills the demand for specialised camera complementary equipment. Their products are known for being practical, solid and durable, are Made in Canada and have a lifetime warranty. Their products are designed for both the amateur and the professional cameraman, and they greatly reduce the weariness and constraints of operating a camera during long hours. 15MM ROD BLOC WITH THREADS 3 / 4-20 ?-16 with MAGIC ARM 11"